Observation - Tormentil - UK and Ireland. 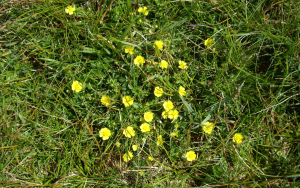 Description: This plant was on the top of the sea cliffs, it seemed quiet small and at first thought it might be creeping Tormentil but all flowers had four petals. The size may be due to this plant being in a very exposed location? This plant was on the top of the sea cliffs, it seemed quiet small and at first thought it might be creeping Tormentil but all flowers had four petals. The size may be due to this plant being in a very exposed location?